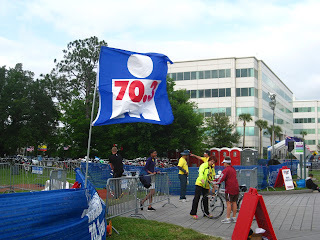 It's about the journey...: Nola (sixty something point something) race report! 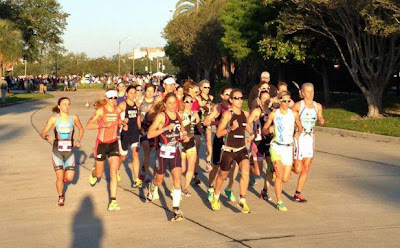 Nola (sixty something point something) race report! 1. The swim might get cancelled. 2. The bike might test my mettle a bit more than expected. For anyone who's ever seen my race splits, #1 was something I wasn't going to lose too much sleep over. 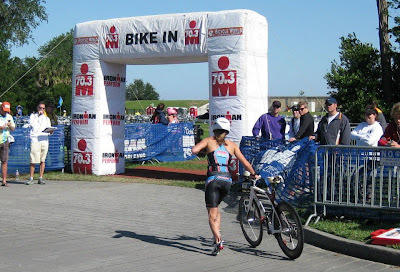 I did want another opportunity to try to better my swim, but if it didn't happen, I'd also take the opportunity to start the bike a good 5-7 minutes up in the field from where I'd normally be starting. Whatever happened, happened. Not like any of us could control the weather, after all; and the race director did put in a valiant effort to move the swim to a calmer location, to no avail. Riding in heavy crosswinds, though, did make me a bit nervous. I tried to push it out of my mind, as most of the long rides that Dave and I have done have been on fairly windy days. We arrived in New Orleans on a beautiful Friday evening. By that point, the bike had already been shortened by 4 miles due to some debris on the course, and the swim was still in question. Saturday morning, the official call that the swim had been cancelled and replaced with a two mile run was relayed to us. This did light a little bit of a fire in the runner in me-as Jesse had told me, it'd be a good opportunity for me to experience actually biking around some of the other pro women, like I'll hopefully be able to do someday in the future if my swim ever comes around. I was optimistic. That was, until Dave and I hopped on the bikes for a few minutes later that afternoon, just to get an idea of what the winds would be like. Holy crap. I spent maybe 15 minutes on the bike, leaning into the wind, not anywhere near aero, just trying to keep myself on the road. Turns out, we were actually riding on the section of the course that had been cut off, and the wind there was stronger than it was on the rest of the ride (it was covered with sand and rocks too, which didn't help matters). After watching the winds whip the flags in transition around while dropping off our bikes, my anxiety level was raised a bit. Still, Andrea, my former high school training partner (in mediocrity) who's now a New Orleans transplant and has ridden that course countless times, reassured me that the winds on Lakeshore, the first portion of the race, would be the worst. Plus, I know myself well enough to know that come race day, I usually do ride with less fear. Wind-whipped flag on the day before the race...yikes! Sunday morning rolled around quickly-getting in on Friday evening, as opposed to Thursday night, as we had for Galveston did make pre-race preparations a bit more rushed. Still, race morning went smoothly. The cool temperatures provided a nice chill while setting up in transition, and the wind didn't seem quite as brutal as it had the prior evening-or at least, I convinced myself that it didn't. Plus, looking around the rack, I saw that a good number of the pro women were riding discs-something that convinced me to man up a bit. After a brief warm-up, the pro men were off, followed by us three minutes later. Jesse had given me some pacing guidelines for the first short run, but with instructions to dip below them if it meant the difference between staying with and losing the top group. Well, I did have to dip below my planned pace to stay with the group. Still, pace felt very manageable, and I managed to enter T1 with the lead group of ten women. However brief it was, that run had proved to be a bit surreal to me-I was running in a group containing the Ironman champions I'd spent the past couple of years watching online with a sense of admiration and inspiration. I was running with Mirinda Carfrae and Cait Snow, both of whom ran faster in Kona last year than I've ever run a marathon open. What was I doing? I couldn't help but smile to myself; I knew I'd soon lose most of that group on the bike (heck, in transition, for that matter), but I'd enjoyed the brief, rare opportunity to run alongside some of the best in the sport (however submaximal it was for them) while it had lasted. Hopefully someday my swim will get to the point where I won't be bringing up the rear until the run, but until then, I'll take moments like these. Heading out. I believe my line of sight is right on Mirinda and Cait, and I'm probably wondering what the heck I think I'm doing. As expected, I got dropped by most of the group in T1. Although my first transition wasn't the debacle it had been in Galveston, there's only so fast one can get through when she lacks flying mount, put the shoes on as you ride skills. I still honestly can't imagine myself performing this task. Anyhow, we were off onto the first portion of the bike course which was just a quick out and back that I felt probably had the strongest crosswinds of the day-then again, it could just have been because I had just started, and wasn't totally comfortable yet. My less than stellar bike handling skills caused me to slow way down at the traffic circle turnaround and drift towards the path of another competitor (bike sorry #1! I feel like a jerk that you had to yell "on your left" at me! ), but I made it through the worst of the crosswinds without major incident, except for a few minor, self-imposed scares coming down off the overpasses. The Kestrel and my Gray race wheels were handling as well as could be expected. I had been running a bit high in terms of goal power and HR early on to make up some of the ground I'd lost in transition. Then, around mile 10, I recognized QT2 teammate Cait (thanks to QT2 camp, in which I'd spent a couple hours focusing on it while trying to stay alive during the stomach-bug long ride of minimal fueling). Perfect-in my conversation with Jesse the day before, he had noted that we'd been hitting similar numbers in training, and I know that Cait is a far more experienced, far steadier, far smarter rider than I am at this point. I established the draft zone, latched on, calmed down, and began to feel better. Cait was fantastic at keeping the wattage steady (thank you!!) throughout the ride (my garmin file looked much more consistent than normal, despite the fact that my watch was flipped the wrong way on my wrist, making it difficult to see regular numbers), which meant that I lost track of any awareness of headwinds, tailwinds, and crosswinds. I was feeling good, and the miles continued to tick away. Somewhere in the 35ish mile range, a couple things happened: I ran out of fluids (Jesse had made me take off my trillions of hydration apparatuses after Texas), and we caught up to a couple of other women, who we began going back and forth with a bit (I actually had to pass Cait at a couple of points to avoid potential penalty, which was something I had zero desire to do, given how well the ride had been going, as I'd been appropriately challenged in just trying to hang on at that point; luckily, she quickly slipped right back past me). Add to this my less than stellar bike handling skills, and a recipe for near disaster arose at the next aide station. Despite my reluctance to let go of my bike, ever, I decided that going 45min without any sort of fluids heading into the run was probably a bad idea, and that I'd have to be a big girl and grab a bottle. Well, true to form, I froze until the very end of the station, slowed way down, grabbed a bottle, and immediately lost control of the bike a little bit, veering directly to the left, where the other women were passing me. I managed to gain control at literally the last possible second, but still knocked my front wheel against another woman's back wheel. Holy crap, that got the heart pounding. The collision was so low speed and low impact that we both stayed upright, but I felt absolutely awful that my terrible bike skills had almost cost someone else her race. I apologized a few minutes later when I caught her again, and she was incredibly nice about it, but still. Bike skills training certainly needs to be on my to do list. After that, I managed to make it back to T2 without further incident, feeling strong. I had no idea of my overall ride time, so I was later pleased with my 2:16; although the distance of the ride had been shortened (and the course flat), it still represented a fairly significant jump in HIM ride speed for me. I'd take it. (Garmin file here). Coming into T2. I feel like the three men that are looking at me are probably saying something like, "look at that girl. She's the only pro who has no idea how to get her shoes off while still on the bike." After a not horrific T2, I headed out onto the run course. Needless to say, my time spent trailing Cait ended almost immediately, as she took off on her race-best blazing run. My instructions for the run had been a bit more aggressive than they had in Texas-6:15-6:20 pace, starting with a HR over 170. When Jesse had told me this, the thought that I'd never even run that pace for an open half marathon glanced through my mind. Still, I've been coming to realize something curious in the last couple of months with QT2: when I've been told something that I can or will do, my response has normally been something along the lines of that would be nice, while I'm typically thinking something along the lines of, that is way overoptimistic. Good rhetoric, though. Then, it'll actually happen as predicted. Darn. Guess I don't know myself as well as I thought I did. So, while the pace plan sounded a bit daunting to me, I'd do my best to execute it. After all, I know how to run hard, regardless. Despite the fact that I had felt stronger on the bike than I had a few weeks ago in Texas, I felt more sluggish from the get-go on the run. So, it wasn't going to come quite as easily as it had last time. Well, game on anyways; time to draw upon all those good training runs done on tired legs. Given that I felt like I was slogging along early on, I was pretty pleased to see 6:11 flash up on the garmin when I hit the mile mark. Well, ok. I continued on like this for several miles; I never felt good, but I was able to hold pace (and I managed to smile at a few people here and there). Halfway through, I hit a bit of a low point, but rebounded a bit with the help of a powergel and Jesse's encouragement that I had one more girl within reach. I managed to catch her, and spent the last few miles in the normal state of pain that a hard race entails. The course had begun to fill up, and one man attempted to pull me along with him. By that point, I knew that I'd be finishing with my best 70.3 (or 67.1, close enough, I suppose) run time; the question had become if I could sneak in under my open half pr. Finally, I made the turn into the finish, navigated my way through the seemingly endless finishing stretch, locked up seventh place, stopped my garmin, and was quite happy to see a pr 1:22 on the screen. Rumor has it this girl can run, the announcer had stated after calling out my name as I crossed the line. I briefly felt like a badass (and then thought about my swimming. Oh well). I certainly wasn't expecting a race split anywhere close to a 1:22 (heck, I still would be happy with that as an open time-garmin file here). It's comforting to know that after 15 years of running, there still can be an element of surprise associated with it. I have to say, working with QT2 has forced me to change my approach to running somewhat dramatically. As much as I resisted (and complained to Mary) about the changes at first...they seem to be working. So, thanks for bearing with me, everyone. Altogether, the race was greatly encouraging to me, and I think I might just be beginning to recognize a little more potential in myself than I saw beforehand. I still feel the new kid on the pro block, just trying to feel my way through it (although, Sarah Piampiano's win showed that that's no excuse! ), but I'm thrilled to have the opportunity to compete against the caliber of women I'm finding myself surrounded by on race day (however intimidating it may be). Hopefully, I'll be able to continue to make the most of it. Needless to say, I certainly benefited from the swim cancellation. Still, upon analyzing the results, although speculation is somewhat worthless, I think I still could have snuck into the top 10 even with a swim (we'll never know for sure, though). I'm now looking forward to my next 70.3, Mooseman, where, if all goes according to plan, I should have a good shot to put together three good legs (and climb some hills and test my progress in the past year to boot)! 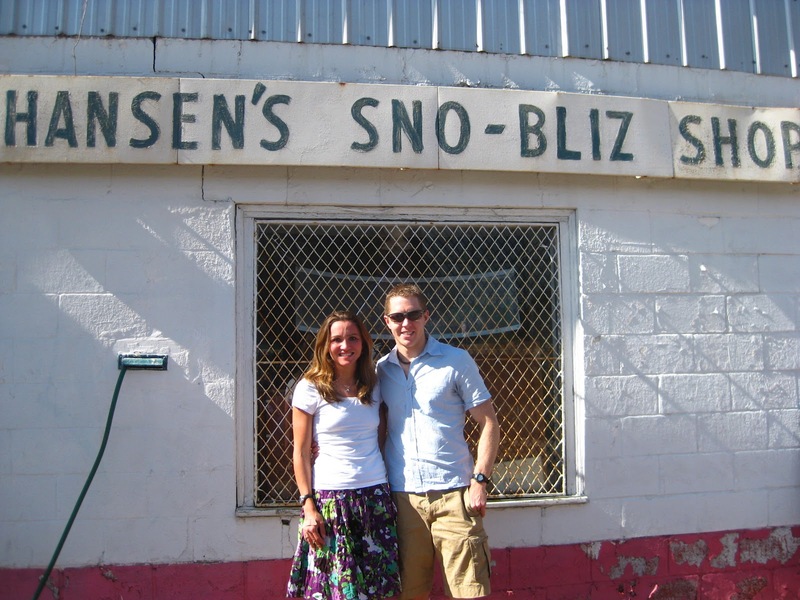 After the race, our New Orleans guru Andrea took us around (Dave also ran a HUGE half marathon pr, good day for the Hansens) to sample some local highlights-sno balls (not snow cones, from a place called...Hansen's!) and boiled crawfish (mmm...mini lobsters with spice). I have to say, Dave and I both enjoyed our stay in New Orleans. The city has tons of character, and spending some time down there really gave me a greater respect for what it and its people went through and have recovered from following Katrina. All in all, the trip was a positive experience, and hopefully a good building point as I continue on! Thanks again to everyone for their generous support and congrats throughout the course of the weekend-I'll never be truly alone out there! Also, thanks to Kestrel, Powerbar, Woolsports, ridecarbon.com, and of course QT2 for my their contributions to all my various biking/apparel/fueling/racing needs! 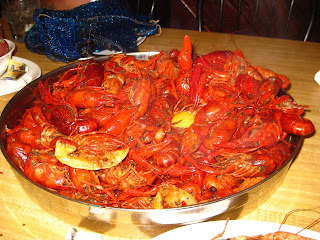 Our crawfish! Tasty little suckers. 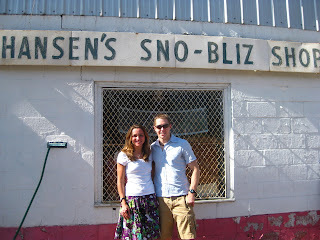 Dave and I at Hansen's! Coolest place ever, thanks to the name. Nice work with the DU! Are there any group rides that you can get in on up there?? Honestly that's the best way to get more comfortable on the bike. Being in a huge group of riders(take your road bike of course!) you'll get used to wheels bumping and people touching you while you ride. It feels really dumb but that's the only way to get better! Thanks guys! Alyssa-those drills actually do seem like they'd help-I'm terrible with cornering, water bottles, shoes, descending, etc! And Jessica, that story is classic. I could see myself doing the exact same thing-I can't do anything on a bike if I'm thinking about it, haha! I just watched a video of a bunch of pro women in a race falling all over the place trying to do flying mounts, so maybe the remedial way isn't too bad, after all!